President-elect Donald Trump says people who burn the American flag should be punished. He suggested that punishment could be up to a year in prison or a loss of citizenship. But it will not be easy for Trump to carry out his proposal. In 1989, the U.S. Supreme Court ruled that flag burning is protected under the First Amendment of the Constitution, which guarantees freedom of speech. Changing a Supreme Court decision requires either amending the amendment or a new opinion by the High Court. Neither is easy to get done. The Supreme Court case involved a man named Gregory Lee Johnson. He was arrested in 1984 for burning an American flag at the Republican Party’s national convention in Texas. Johnson said he set the flag on fire to protest the nomination of Ronald Reagan for a second term as U.S. president. A lower court had ruled against Johnson. But the high court overturned the decision. 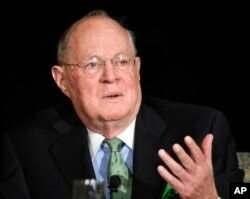 Justice Anthony Kennedy wrote that a lot of Americans are offended by the burning of the American flag. But he noted that in the Texas case, Johnson burned the flag as an act of protest. As an act of protest, he said, flag burning is protected under free speech. Four Supreme Court justices agreed with Kennedy. Four others disagreed. Writing for the minority judges, Justice William Rehnquist noted that burning a flag is not really free speech. He said it is more like a person grunting, making sounds like an animal. Trump has not said why he is raising the flag burning issue now. But his comments on Twitter came after a group of U.S. military veterans protested at a small Massachusetts college last weekend. The veterans objected to the removal of an American flag at Hampshire College, a private school in the town of Amherst. The removal came after some students lowered the flag to half-staff on November 9th. That was the day after the U.S. presidential election, of which Trump has been declared the winner. Flags are flown at half-staff to recognize deaths of important people or to recognize sad events. Some Hampshire College students and teachers said they are fearful of what will happen under Trump’s presidency. The flag continued to be flown at half-staff until November 10th, when it was burned. The college says it does not know who burned the flag. A new flag was ordered flown at half-staff. But later, College President Jonathan Lash ordered the flag removed, saying some had seen it flying at half-staff as a comment on the presidential election. It was not, Lash said. He said it was part of an effort by the college to deal with divisions over the flag among members of the college community. “We’ve heard from members of our campus community that, for them and for many in our country, the flag is a powerful symbol of fear they’ve felt all their lives because they grew up in marginalized communities, never feeling safe,” Lash said. On CNN television Tuesday, Trump spokesman Jason Miller said that the country’s next president believes flag burning should be illegal. “The president-elect is a very strong supporter of the First Amendment, but there’s a big difference between that and burning the American flag,” Miller said.